La Voz Kids is about to begin auditions for the new season. The Spanish language kids singing competition is looking for talented young singers to compete on national TV. La Voz Kids or La Voz: Ninos airs on the Spanish language Telemundo network. The show is a spin-off of the hugely popular ‘The Voice’. Since the show is based on the Voice, it uses the same principles and format which are blind auditions, then the battle rounds, and finally, the live performance shows. Telemundo is coming back with season 3 of the popular kids singing competition bringing back the kids singing competition, La Voz Kids for another season to air in 2015 and open auditions are right around the corner! Auditions for La Voz Kids Season 3 will begin shortly. Please the the below flyer for more information and details about the submission process. This is a competition for kids but youngsters will need to get their parents involved because kids will only be allowed to audition when accompanied by a parent or guardian. Also, only the parents will be able to register their children for an audition spot on the show. Parents will also need to submit for their children – kids will not be allowed to submit themselves. After submission, parents will be contacted with the place, date and time of their audition. The show is holding auditions for kids between the ages of 7 and 15 who can sing in both English and Spanish. The show will be coming to cities nationwide as well as Puerto Rico soon. Casting calls for “La Voz Kids” will be held in San Juan Puerto Rico, Los Angeles, Houston, Miami and Chicago. The world’s most exciting singing competition is BACK for KIDS! La Voz Kids is will be back for an exciting Season 3! 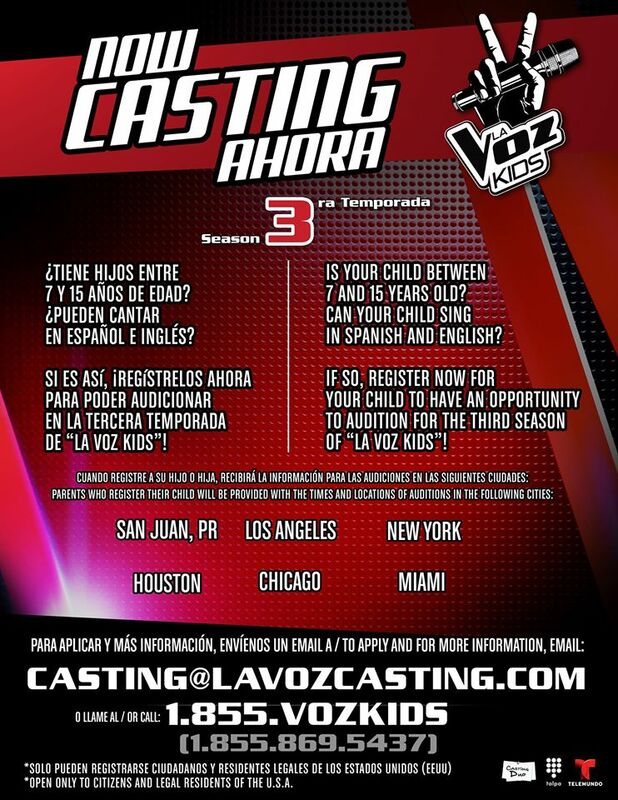 Email us now at casting@lavozkidscasting.com for an opportunity to be apart of the next exciting season! My name is Chantel Diaz and I am 13 years of age. I have been singing since I was 5 years old. Life has been pretty hard for me since the splitting of my mother and father. Although at this point of my life I’m ready to make something of my life and so talent. Nothing would make me any less happier then making my parents and family proud. Please help my dream become a living reality. I wanna be in la voz kids but this is too far. New York would be great. I believe I can but nobody thinks I should go. I want to be in La Voz kids. I just want a chance to make my dream come true, can you make it come true? I want to be in The Voz Kids, am 13 I know I got talent. I only want a chance to show my talent to every one. I wont let you guys down. Only a chance please! Please reply back, Thanks! Reply to Nicolas Garduno: I am sure your dream will come true. My kids want to audition for la voz kids. I want to be in it. I am a GREAT actor!